Made with love, for her 2nd grade grandson, my mil fashioned this little suit from a pj pattern, over 25 years ago. Being the tallest in the class ds was to be Santa is the school play..and of course, each mom was expected to sew the costume..
And she came through wonderfully, plenty big enough to stuff with pillows, the 7 yr old made a stylin' Santa with his front teeth missing! She even stitched a B in the back so he would know which way to put it on! So for all the Nanas and Grandmas out there, you are appreciated...thank you for all you do..
BABY, IT'S COLD OUT THERE!!! 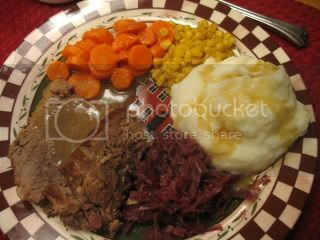 Yesterday was a frigid day, so a Pot Roast with mashed potatoes, gravy, red cabbage, carrots and corn seemed appropriate... So that's WFD..
very sweet story, i love your blog! and you were worried you had nothing to say, and see how easy it all is! I still have items made by Mom and Grandma also..can never let them go! Your roast looks so good..I love those comfort meals! Is that a MC plate??? No, Barb, they are from Christmas Tree Shop...an imitation of something...I will post them..MC, is above my pay scale! I love the suit! Will his son wear it this year? You are good w/ your things..It looks brand new! 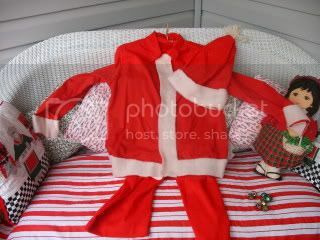 What a wonderful story of a grandma's love making this santa costume and remembering the B for back. You are one of those grandma's now - I am always amazed of the great things you do for your family. Are you going to pass the costume to the gkids this season? Marsha, I am bringing it in to them today, I have to replace the elastic...it has lost its stretch over 25 yrs, me too! I am going to repost that tutorial here..
Monique, it got worn a few times, and it was hung in the closet in our old house, then moved to a closet here. She also made the adult one from a velvet type fabric, velour? and that is hanging up there too. We used to have up to 90 for a Santa Party the week before Cmas...and buffet dinner. I cooked for DAYS! But it is a wonderful memory and the kids who used to come are grown and always mention how they remember that party... We had a big finished basement, and I used to run up and down those stairs with the food...OY, I ached for days! Susan, yes, your gkids will have a trove of costumes! A swan and many more...and if you have gsons...you will be sewing again, so keep those fingers nimble! Addi and I were talking about my mother yesterday; she died four years before Addison was born, but Addison see pictures of my mom around the house and hears stories and will talk about her like she knew her ... very sweet and makes me happy. I love this post, sweet, sweet story, Kathleen! and I love the suit! Yes, tell all the stories, and keep telling. I feel like I knew my great grandparents from all the wonderful stories! Kathleen, what SWEET memories. And I know your dear mil would be so pleased that you have taken good care of her handy work, and shared the story. Thanks for starting my day out with a smile! Kathleen, this makes me recall the beautiful winter outfit that my grandmother knitted for my son Bryon. He was the first grandchild, first great-grandchild so everyone was extremely generous to him. What wonderful memories, and your MIL deserves the recognition. Very special post.